Compare with the asian elephant! 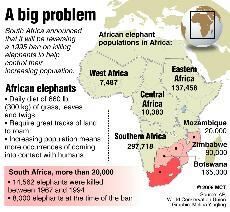 The african elephant is still under threat in some parts of africa, while its starting to become overpopulated in southern africa. Largest living terrestrial animal on earth. The African bush elephant has three nails on the hindfeet and four nails on the frontfeet, which is less nails than than the african forest elephant (five front nails and four nails on the hind feet). It has also greater ears (with the shape of africa) , which seldom may meet above the shoulders. The tusks of the African bush elephant is curved and points more forward, and larger and thicker than those of the african forest elephant. 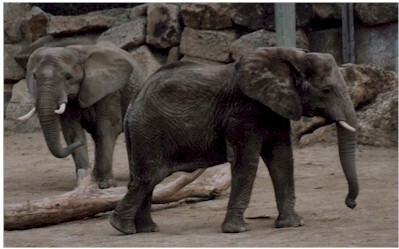 In June 1997, the 10th meeting of the Conference of the Parties to CITES (COP 10) in Harare, Zimbabwe, proposals from Botswana, Namibia and Zimbabwe for the transfer of their elephant populations from Appendix I to Appendix II, all other elephant populations in Africa and Asia remain on CITES Appendix I.